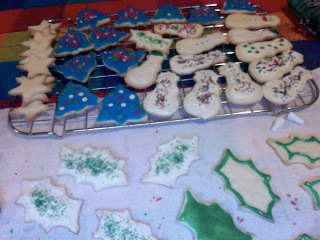 Holiday baking update: the anti-procrastination baking worked really well. Having baked all kinds of things before the holidays, I was both able to give all kinds of decorated cookies to loved ones and I was better prepared to bake "on the fly" during the holidays when the cookies had long run out (unexpected benefit). It turns out that loads of techniques that you use in one kind of recipe transfer to improvisational baking, where you try to make the best of the ingredients you have on hand. My best "on the fly" baking experience was a Victoria spongecake in someone else's kitchen; the centre didn't quite bake for long enough and therefore collapsed a little when the cake was cooling but apart from that it was a success. I took almost 3 weeks away from Toronto for the break, and it was exactly what I needed after a December of frenzied writing. That's not to say that there wasn't a lot to do - paperwork, emails, planning and so on. And if thinking about my current paper counts, then I put in even more time than I do when I'm immersed in actual writing. But keeping a distance from the paper means that now I feel refreshed and ready to jump back in, especially since there's an end date in sight. Not a hard deadline per se, but a date after which I'd love to not have to deal with this particular paper anymore. In previous years, I've had to write term papers before and during the Christmas break, and this was the first one in grad school where that hasn't been the case. It made a real difference: not having term paper(s) to worry about meant that I could relax as soon as I got home and not have a first-week-of-January deadline hanging over me. To all of you in coursework, congratulations for getting through the holiday gauntlet. It's no small achievement, so kudos.